Venezuela's electoral body has confirmed the victory of President Nicolas Maduro in the April election, after carrying out an audit on millions of votes. The Venezuelan National Electoral Commission (CNE) said it had found no discrepancy with the initial results. Mr Maduro won the vote by less than 1.5 percentage points. Opposition candidate Henrique Capriles said the election had been rigged. He denounced the audit as "a fake". 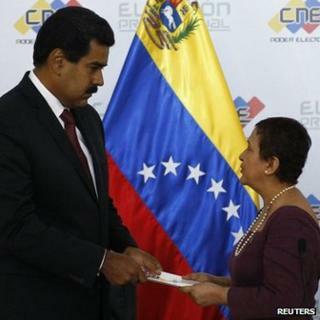 Mr Capriles accused electoral commission president Tibisay Lucena of taking orders from the governing party. "Venezuela has an electoral system armoured against fraud and error," said Ms Lucena. The election was called after the death of President Hugo Chavez, on 5 March, following a long battle against cancer. Nicolas Maduro won the vote by about 200,000 votes. "This audit shows the results of the election are the faithful reflection of the wishes of our citizens," said Ms Lucena. She said Mr Capriles had requested the audit and had agreed with its terms, before pulling out of the process. Mr Capriles had called for a full recount, saying that comparing vote tallies was not enough. The audit examined 46% of the votes cast electronically on 14 April. The commission said the remaining 54% had been checked immediately after the election. Despite the controversy, Mr Maduro was sworn in on 19 April for a six-year term. Mr Capriles has vowed to take his case to the Supreme Court and to international courts.